It's funny how different things trigger the Christmas spirit in each of us. Maybe it's the tree going up, or buying the first present, or hearing a favorite carol. For me, this year, it was seeing the first Christmas kits showing up in the stores. The first one I got my hands on was Tumble Fish Studio's Christmas Junque from Deviant Scraps. It is just loaded with all kinds of vintage and quirky images. I used it to create this sweet little angel. By the time I was finished with this piece, I was humming Christmas carols, and looking for more holiday projects to keep me busy. I've always wanted to do a Christmas album, and I've started more than I can count, so when I saw that Shimelle was offering another Journal Your Christmas class, I had to sign up. Journal your Christmas is an online class to celebrate the holiday season. It starts on the first of December and finishes on the sixth of January, with thirty-seven daily prompts sent by email. Determined to actually finish an album, I got a head start on my book this weekend, finishing the cover and prepping the pages. I'm doing a 5x7 two-ringed album using a 7 Gypsies journal cover for the base. The cover image is from Tumble Fish's Christmas Junque. Throughout the book, I'm using paper and elements from My Minds Eye Lost and Found Christmas collection. And look how well it coordinates with 7 Gypsies Journal Pages. and pockets and tags abound. I've even completed the date tags for the pages, cutting an old manilla folder down to letter size for the printer. The numbers were created using Michelle Coleman's Hand-Stamped Alpha brushes in Photoshop. But one of the things I'm most excited about is using the 12 vintage Santas found in the Christmas Junque kit as a design element throughout. They coordinate beautifully with the Lost and Found papers. So, there's my base. Surely, with this much done, I can keep up with the journaling and add the photos. Once the holidays start, I'll be back with updates. Merry Christmas to all of you, and if you're participating in Journal Your Christmas, I'd love to see your pages. Please link us up in the comments. Yesterday, it rained. And, not one of those pretty little rains that make you want to grab an umbrella and sing and dance like Gene Kelly. No, it was one of those nasty, gray days that leave you chilled to the bone. So, I did what most normal red-blooded Americans would do. I felt sorry for myself. But only for a little while. i soon turned to my favorite form of therapy and used my bad mood to create an art piece. Check out the face on this grumpy, little blue fairy. Credits: Tumble Fish Studio's Etcetera, Miscellany, Spring Junque, Crazy Legs, My Picks, and Autumn Junque kits, and Lorie Davison's Rough to the Touch. The font is My Old Remington. Up and down. So goes my creativity. So goes my blogging. And while i've recently been on an artistic high, my poor blog has been on a low. So today, we'll just play catch up. Here are some of the digital collage and digital art journaling pages that I've been working on. Credits: Tumble Fish Studio Journaling Pieces 1 kit, available at Deviant Scrap. Credits: Tumble Fish Studio's Summer Junque kits, Noggin Toppers, and At the Beach. Holliewood Art Journal 2 (stitches); Tangie Baxter's Gnat font. Credits: Rosey Posey Finding Jenny kit (with lots of layering and blending). Wordart by Pink Lotty. Affliction font. Julia Makotinsky's Art Fusion overlay. 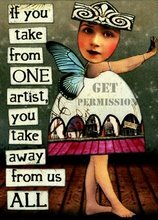 Credits: Tangie Baxter's Studio Box One, Junque Journal, Collage Fodder, and Unconventional Wisdom; Crowabout's Mega Art Journaling; Maya's Scribbler brushes; and Tumble Fish Studio's Journaling Pieces One and Noggin Toppers. And, just one more, this one inspired by the magnificent Eduardo Recife. Credits: Tumble Fish Studio's Journaling Pieces 1; Recife's fonts and brushes.